Summary: Beth Hoffman’s bestselling debut, Saving CeeCee Honeycutt, won admirers and acclaim with its heartwarming story and cast of unforgettable characters. Now her unique flair for evocative settings and richly drawn Southern personalities shines in her compelling new novel, Looking for Me. 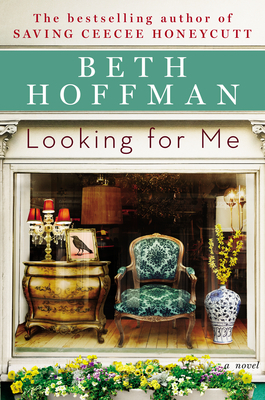 I feel obligated to begin this review for LOOKING FOR ME by Beth Hoffman by saying that I adore Beth. She is truly one of the nicest women that I've ever met in my entire life, and she's a talented writer too! I absolutely loved SAVING CEECEE HONEYCUTT, so it shouldn't come as any surprise that I've been dying to read her new novel. LOOKING FOR ME is a wonderful novel and I'm happy to say that I enjoyed it a great deal -- and that's not because I happen to love the author. This novel is beautifully written and sure to remain in your thoughts long after you finish the last page. The characters and their stories are so complex; and as a result, it touched my heart like few books do. LOOKING FOR ME tells the story of Teddi Overman, a woman who left her family's farm in Kentucky to follow her dream of owning an antique store. She arrives in Charleston and through sheer determination (along with a little luck and kindness) works her way up to having her own store. She even manages to find some special friends. However, Teddi is still haunted by her brother Josh's mysterious disappearance and the effect it had on her family. Teddi has never given up the hope that Josh is still alive despite all the evidence against proves otherwise, and it has wreaked some havoc on her life. She has a strained relationship with her mother and she hasn't been very successful with romantic relationships. When Teddi receives an indication that Josh is alive, she returns home to Kentucky. There she not only learns more about the secrets her family has been keeping, but she also begins to discover herself. LOOKING FOR ME is truly a beautiful book for so many reasons. Any one who has read CEECEE knows that Beth has a knack for storytelling and creating memorable characters, but I think she's outdone herself with LOOKING FOR ME. I absolutely loved Teddi and I loved being along on her journey to self-discovery. Teddi wasn't perfect and had made some mistakes in her past, but her heart was so big... and her actions were so generous. I was just thrilled that she was able to come to terms with her past and eventually find some sort of peace and happiness. In many ways, LOOKING FOR ME was Teddi's coming-of-age story. And this girl loves a good coming-of-age tale. I think the way Beth chose to tell this story added to my enjoyment. The book took place when Teddi was an adult but it also had flashbacks to her childhood. I loved that I was able to see Teddi as a child, and especially her relationship with Josh, because it gave me additional insight into the adult that Teddi became. I appreciated seeing just how much she grew as a person and how her family and friends shaped her life. Rather than go on and on about how special LOOKING FOR ME is, I thought I'd mention how this book affected me personally. When I picked up this novel, I certainly expected to be entertained and even touched by the story, but I didn't expect it to make me think and feel quite as much as it did. I think (no, I know!) that's a testament to Beth's writing. There were just so many quality characters in this story whose actions made a difference in the lives of others. I definitely walked away from reading this novel holding onto the idea that giving back to others is so important whether it be through friendship, support, kindness or even financial aid. I don't claim to know Beth well, but I have spent some time with her; and I can honestly say that she has a heart of gold. From the little I do know about Beth, I have a feeling that LOOKING FOR ME is a book that's very near and dear to her. So much of this story just seemed to have Beth written all over it -- from the characters' love of animals, to the setting of a Kentucky farm, to Teddi's passion for antiques and furniture, to the generosity of the characters. I actually felt as if I had a little glimpse into her mind! Naturally, I'm going to recommend LOOKING FOR ME for book clubs! It really is the ideal book for your next meeting. There is a reading guide which delves into some of the major themes, but there is so much to discuss that I'm not even sure you need one -- maybe it will help keep your conversation on track! Some of the things you might want to explore include secrets, family dynamics, parent/child love, forgiveness, passion, kindness, charity, and hope. LOOKING FOR ME is a well-written story and I promise that it will touch your heart! Highly recommended. Giveaway alert: I have an audio copy of the LOOKING FOR ME, courtesy of the author, to share with one lucky reader. To enter, just fill out the form below before June 6th at 11:59 p.m. EST. I will randomly select and notify the winner the following day. This contest is open to those of you with U.S. addresses only. Good luck! Love love love Beth. Once I get through The 5th Wave on audio, I'm going to have to toss a coin between this one and the Hosseini, but they are both causing me much excitement and it just looks like I'm going to have a pretty awesome few weeks in that category! You are so right about Beth - she is one of the warmest people you will ever meet. I'm so excited to see her new book getting great reviews like yours! Everyone who met her loves her! What a beautiful review! I'm delighted that you were moved by the complexities of Teddi's life and the people around her. Thank you so, so much, Julie! I have been looking forward to Beth Hoffman's book since I read Looking for CeeCee Honeycutt! Truly, Beth is one of the most generous and kind people I've ever met. Looking for Me resonated with me. I loved her first book - and can't wait for this one! Thanks for the great giveaway.